This section will explain the structure of the RadUpload's template. Here is a snapshot of the template generated in Expression Blend. [Border] - represents the outer border of the RadUpload and is of type Border. [Border] - represents the inner border of the RadUpload and is of type Border. RootElement - hosts the template elements and is of type Grid. [Border] - represents the outer border and the background of the RadUpload's header and is of type Border. [Border] - represents the inner border of the RadUpload's header and is of type Border. ProgressCaptionText - represents the text in the RadUpload's header and is of type TextBlock. IconError - hosts the visual elements, that represent the error icon, and is of type Grid. [Path] - represents the shape of the error icon and is of type Path. [TextBlock] - represents the symbols inside the error icon and is of type TextBlock. [Border] - represents the background of the RadUpload's content area and is of type Border. [ScrollViewer] - hosts the content of the RadUpload and is of type ScrollViewer. [ItemsPresenter] - displays the RadUploadItems and is of type ItemsPresenter. 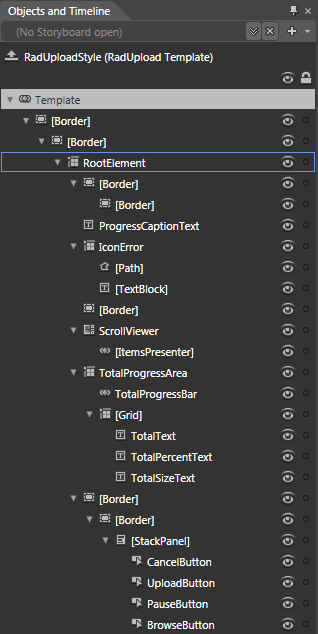 TotalProgressArea - hosts the elements of the total progress area (the overall details) and is of type Grid. TotalProgressBar - indicates the total progress of the upload and is of type RadProgressBar. [Grid] - hosts the text elements of the total progress area and is of type Grid. TotalText - represents the label of the total progress area and is of type TextBlock. TotalPercentText - displays the progress of the total upload in percentage and is of type TextBlock. TotalSizeText - displays the total size of the upload and is of type TextBlock. [Border] - represents the background and the outer border of the command area and is of type Border. [Border] - represents the inner border of the command area and is of type Border. [StackPanel] - hosts the buttons in the command area and is of type StackPanel. CancelButton - represents the Cancel Button and is of type Button. UploadButton - represents the Upload Button and is of type Button. PauseButton - represents the Pause/Resume Button and is of type Button. BrowseButton - represents the Browse/Add more files Button and is of type Button. 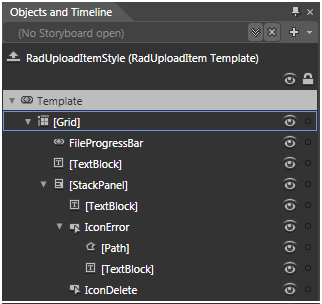 This section will explain the structure of the RadUploadItem's template. Here is a snapshot of the template generated in Expression Blend. [Grid] - hosts the elements of the template and is of type Grid. FileProgressBar - represents the progress bar for the RadUploadItem and is of type ProgressBar. [TextBlock] - displays the name of the file and is of type TextBlock. [StackPanel] - hosts the details for the file and is of type StackPanel. [TextBlock] - displays the size of the file and is of type TextBlock. IconError - hosts the visual elements, that represent the error icon, and is of type Button. IconDelete - represents the remove file icon and is of type Button.